Tyndall National Institute and Waterford Institute of Technology’s Telecommunications Software & Systems Group (TSSG) have signed a memorandum of understanding (MoU) that will seek to draw down €82m of funding available through the EU’s Horizon 2020 programme and create 10 spin outs. The MoU will formalise a partnership between the two research institutions to create a full end-to-end offering in the IoT space. The MoU is targeting the creation of 10 new spin out companies based on IoT technologies that will span across multiple sectors. Tyndall and TSSG are currently collaborating on several projects across the energy, agriculture, environment and health sectors to deliver a tangible connection for people between the physical and connected worlds. 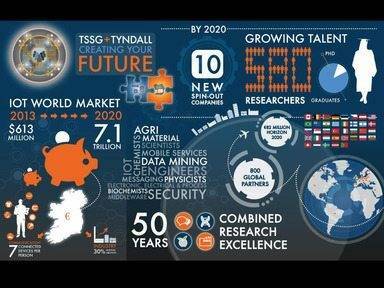 “Our combined staff of 580 hardware and 120 software engineers, support staff and scientists, together with Tyndall and TSSG’s world class infrastructure make this partnership uniquely qualified to deliver,” said Dr Kieran Drain, CEO, Tyndall National Institute. “At Tyndall we passionately believe that Irish technology companies have the potential to lead on IoT and that it is our role to facilitate and accelerate their growth from product conception through to commercial reality. According to Prof Willie Donnelly, director of TSSG, the partnership will place Ireland at the centre of the IoT conversation, positioning the country as a location of preference for the IoT industry.